KIEV, Ukraine -- As the crisis in Ukraine drags on, U.S.-Russia relations continue to deteriorate. The United States has just taken a step that risks bringing that relationship to a new low. 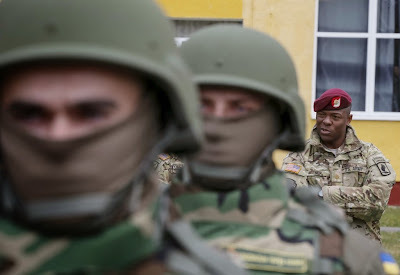 A serviceman of the 173rd Airborne Brigade Combat Team of the U.S. Army looks on as Ukrainian National Guard line up before an opening ceremony of joint military exercise “Fearless Guardian 2015″ at the International Peacekeeping Security Center near the village of Starychy western Ukraine, April 20, 2015. As part of its effort to support Ukraine, the U.S. military recently sent 290 troops from the 173rd Airborne Brigade based in Vicenza, Italy, to train the Ukrainian National Guard. In doing so, President Barack Obama is responding to widespread political pressure to “do something,” choosing a middle ground between doing nothing on the one hand — or, on the other, embroiling the United States more deeply in the conflict by sending billions of dollars of lethal weaponry to Ukraine. To understand why, consider the historical context. Since the end of the Cold War, Russia has watched as the NATO alliance has expanded across Central and Eastern Europe to the Russian border. As a result of this expansion, when the Maidan revolution in Ukraine overthrew former President Viktor Yanukovych, who had close ties to Russia, President Vladimir Putin and his advisers were convinced that this was a precursor to bringing Ukraine into NATO — a step the Western alliance had introduced previously. For Putin and the Russian establishment, however, preventing Ukraine from turning decisively West is an existential issue. U.S. ambassador to the Soviet Union Jack Matlock once told me that the possibility of NATO membership for Ukraine, for Putin, was and is something equivalent to Soviet missiles on Cuba for Kennedy. First, Russia will likely become even more brazen in its support for its separatist proxies in Eastern Ukraine’s Donbass region. This support could involve the introduction of additional troops and weaponry, or even a possible spring offensive to capture the southern Ukrainian city of Mariupol as part of a “land bridge to Crimea” from southern Russia across Ukraine. This aggression would be the end of the already tenuous Minsk II cease-fire, which was designed to end the conflict in Ukraine. Put simply, Putin enjoys “escalation dominance” at every level of the conflict in Ukraine — any move the United States makes, Putin can match and surpass — and the Obama administration needs to be prepared to see Moscow double-down in the Donbass. Second, we will likely see further nuclear saber rattling by the Russians in the upcoming weeks. Due to its weakness vis-à-vis the United States in conventional weaponry, Russia’s nuclear doctrine has recently changed to consider the use of nuclear weapons as a way to “de-escalate” a conflict. As if to emphasize its status as a nuclear power, in a March documentary that aired on Russian state-owned television, timed for the one-year anniversary of its annexation of Crimea, Putin startled viewers by stating that he had been prepared to put Russia’s nuclear forces on full alert at the beginning of Moscow’s operation in Crimea. To back this up, recent Russian military exercises have included nuclear-capable weapons, such as the TU-95 nuclear bomber fleet, which in the past year has engaged in fly-by missions near Guam, the Alaskan coast, the Baltic region and the UK. These actions increase the risk that each party will misunderstand the other’s intentions. In 1979 and twice in 1983, the United States and Soviet Union had frightening incidents where each side believed that a drill by the other was the precursor to a real nuclear attack. Last year Russian missile testing allegedly violated the Intermediate-Range Nuclear Forces Treaty (INF), a 1987 pact that eliminated all of the United States’ and former Soviet Union’s nuclear and conventional ground-launched ballistic and cruise missiles with ranges of 500 to 5,500 kilometers. Russia recently moved 10 nuclear-capable Iskander missiles with a range of 400 kilometers into Kaliningrad, an exclave that borders Poland and Lithuania. It also terminated an agreement with Lithuania to provide information to Vilnius about Russian weaponry in Kaliningrad. None of this is in America’s interests. It is also quite possible that Moscow will make additional efforts to undermine America’s NATO allies, particularly the three Baltic states of Latvia, Estonia and Lithuania. Indeed, Moscow just initiated new criminal charges against an Estonian intelligence officer in Russian captivity. The fact that this was announced on April 20 — the same day that American troops began training exercises with their Ukrainian counterparts — is probably not a coincidence. Russia also just took a small, but provocative step against NATO member Norway. Russian Deputy Prime minister Dmitry Rogozin, who is banned from entering Norway due to international sanctions against him over Ukraine, stopped on the Norwegian island of Svalbard on a trip to the North Pole — an action that infuriated Norway. Russia’s actions against both Estonia and Norway are right out of the Kremlin playbook. They are small, seemingly insignificant steps that are over and done before the West even realizes they’re happening — but which nevertheless send a threatening message to American allies. Finally, Russia can take any number of actions to cause further disruption in the Middle East, especially vis-à-vis Iran. Not surprisingly, the impending sale is causing concern in Washington as well as among U.S. allies such as Israel and Saudi Arabia. The Obama administration objects to any action by Moscow that could destabilize its P5+1 negotiations with Tehran. While sending fewer than 300 American troops to Ukraine may seem insignificant, Moscow does not see it that way. The ride is about to get rockier.